I would call this one "fruitcake for beginners." The reason is that the cake itself doesn't exactly taste like fruitcake. The fruit includes cherries, raisins, pineapple, orange and lemon peel (and turmeric, son of a gun). I see the ingredient quality goes downhill from there: partially hydrogenated shortening, propylene glycol, mono and diesters of fats and fatty acids? Yikes. There are so many brackets in these ingredients, I'm not sure if that's just a subset of some other ingredient. But what makes this one quite different tasting are the spices: they use cinnamon, cloves, ginger, and molasses. 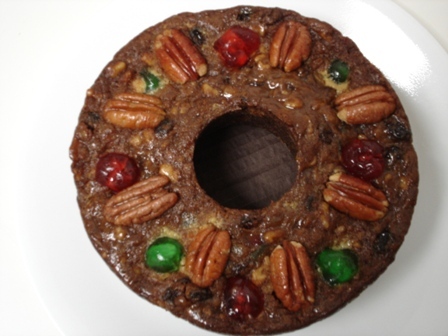 The fruit is cut quite small so there's an even texture, not huge lumps of fruit, and the overall flavor of the cake itself is almost more like a gingerbread than a traditional fruitcake. This cake--which I actually went to a store to purchase($29.95) includes molasses so has that richer, darker flavor, though it is alcohol-free. It comes in a really adorable tin (they also have a smaller 1-pound fruitcake for $19.95 without the tin), very nice for giving. The garnish fruit on top actually taste different than any others I've had--these really taste candy-like, almost like colored licorice or a jujube. 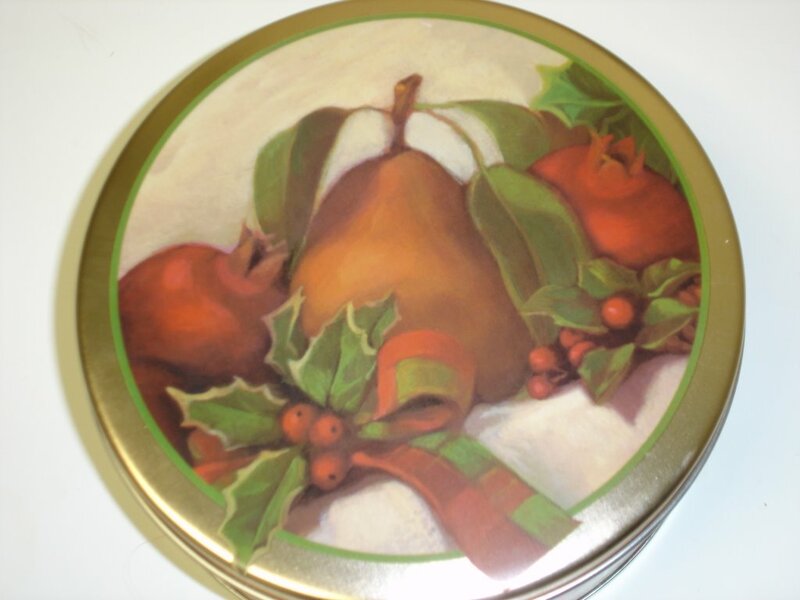 I've been sorely disappointed with the mass-produced fruitcakes out there--those fruitcakes shipped out by those traditional places one goes to to order fruit, meat, and food baskets for the holidays. So if you wish to send a fruitcake to someone you love (and bully for you!! ), I'd say the rule of thumb is: monasteries first; dedicated fruitcake bakeries second; and finally, if you're going to use any of the big food basket places, try this fruitcake. Hi, I got directed to your blog by a post on the ChicWIT listserve and have really enjoyed reading your persnickety and impassioned reviews, although I will confess to not being much of a fruitcake person myself. That Gethesmani fruitcake sounds might tempting but I probably do not need to be discovering MORE desserts to enjoy at Christmas! I thought you might be intersted to know, if you like baking, that Rose Levy Beranbaum has a recipe for leckerti (which she calls fruitcake gems) in her Christmas cookie cookbook.